Join Hannah and Evan on a journey in analog game design as they set out to redesign their first roleplaying game, Questlandia. Are you a junk poet or a world weaver? Can you Kickstart a roleplaying game in a three-ring binder? It’s as close to live game design as it gets, and we’re inviting you along for the ride! Hannah grew up on point-and-click adventures games and purple-aquamarine ‘90s tracksuits, and never really grew out of it. 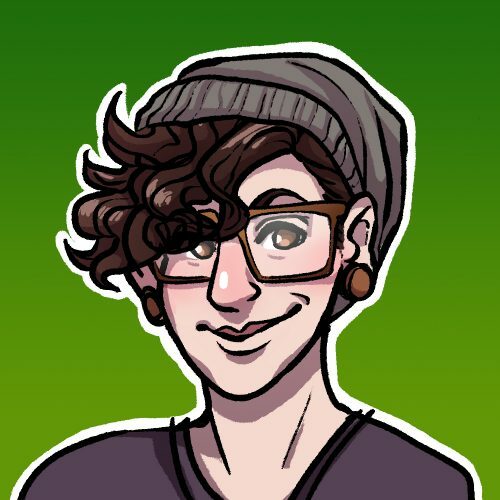 She designs games around themes of queerness, empathy, and optimistic nihilism. You can find more of her work at makebigthings.com, where she creates board and roleplaying games as part of the Make Big Things co-op. Evan is an avid player and creator of both tabletop and coimputer games. He’s worked previously on Questlandia, 14 Days, Noirlandia, and is developing the upcoming video game Goblin Diplomat. His favorite game is Go. If you ask, he will definitely play Go with you. A good GM can step up to manage social dynamics at the table. But in Questlandia 2, there is no GM, so the rules we write need to do some heavy hauling. How can we keep the excitement and ideas flowing without leaving quieter players out of the fun? What happens if a player achieves their big character goal in the very first scene of the game? We found out. With no GM, players in Questlandia 2 are responsible for framing their own scene types. As a result they animate objects, make holy voyages, and befriend a sentient wall. Good games are often built on an avalanche of bad ideas. We talk about the worst ideas we’ve had so far, and how to turn them into something useful. We talk about deadlines, and the whooshing noise they make as they go by. The first playtest that takes us all the way through character creation. Meet beasts of burden, puppeteers, and the queens who inhabit Mosslicker Alley. We experiment with a customized alethiometer to explore stories and build new worlds. The Make Big Things team talks about making games as a cooperative. With one playtest down, we talk about what went right, what went wrong, and what we’d like to change. We attempt to put theory into practice as we prep for Questlandia’s first playtest.